Anxiety is probably the most common psychological problem all over the world. Over seven million people in the United States of America are suffering from it. Using herbal remedies can be a wise approach to treat this condition naturally. However, you are advised to consult an experienced herbal practitioner to find out the adequate dosages for you, depending upon your specific condition. There are no general guidelines for the same. Every case of anxiety can be different and the dosage is determined accordingly. Always remember, even though herbal remedies are natural, over-dosage of them can cause certain side effects and even worsen the condition. Following is a brief rundown on some of the most effective herbal remedies for anxiety and how they can benefit you. Wood betony is one of the most powerful natural drugs to treat anxiety. This herb can improve your memory and clarity of thoughts quite effectively. It makes your neurological functions much stronger and also provides you the much needed relief from neuralgic pain and headache. If you are going through an overactive, edgy state, taking wood betony will calm you down. Though it has sedative effects, it relieves nervous exhaustion, anxiety and tension quite effectively. Wild lettuce is a gentle tranquilizer, which is considered more suitable to treat anxiety problems in adolescents and children, but it can benefit adults also. It is particularly very beneficial for those who are also suffering from insomnia. It also calms down an excitable, overactive nervous system. Vervain is commonly referred to as verbena. It calms hysteria and controls anxiety quite effectively. It provides better strength to your nervous system, reduces tension and helps you to relax. The verbena herb has also been found to be beneficial in cases of depression that occur after a flu or cold. If you are suffering from poor concentration because of anxiety, valerian can be a wonderful herbal remedy for you. Valerian is considered as a powerful muscle and sedative/relaxant. It provides great relief to those who are experiencing insomnia, restlessness, muscle tension (such as, due to overwork), stress and anxiety. The medical term used for this herb is hypericum perfoliatum, but it is popularly known as St. John’s Wort only. This herb is known for its long-term effects on patients suffering from tension and anxiety. It also works wonderfully in cases of depression and irritability. In addition to that, it carries several other health benefits also. For example, it can provide you relief from neuralgia, arthritis, fibromyalgia and other pain syndromes. Moreover, St. John’s Wort also works effectively for those women who are experiencing mood changes during menopause. 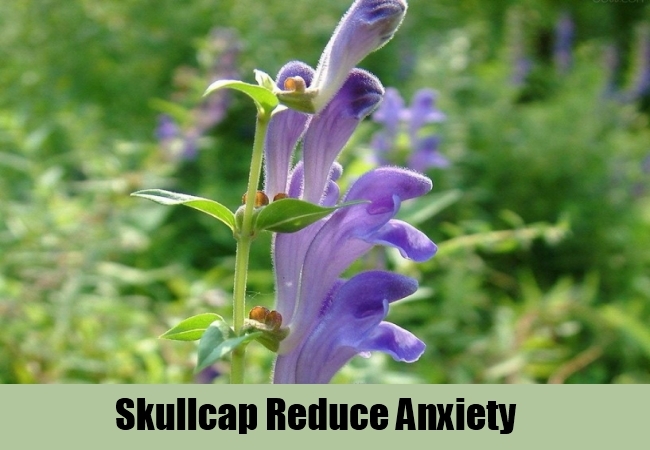 Skullcap is a natural antispasmodic and pain reliever, which works wonderfully in reducing nervousness and restlessness. It is one of the most popular herbal remedies for anxiety. It eases stress during PMS and is also very useful in relieving exhaustion, depression and hysteria. It calms oversensitivity and relaxes the nervous system. When it comes to using herbal remedies to treat anxiety, passionflower also makes a very popular choice. It is very effective in treating nervousness in both elderly and children. It induces mild euphoria and provides the much needed relaxation to your body and mind. It also promotes refreshed, restful sleep. Overall, passionflower is a sedative herb that has wonderful natural ability to relieve neuralgia, headache, spasms, tension and anxiety. Mothervvort is a popular herbal remedy for anxiety. It is a mild sedative but very relaxing herb. It is particularly very beneficial in relieving certain symptoms like shallow breathing and a racing heart. It works gently especially in those cases of anxiety that occurs because you are under pressure (such as, because of a work deadline, heavy loads of work or a difficult financial situation). The great thing about linden is that it provides you natural protection against diseases that are often caused due to anxiety and stress, such as gastric ulcers, palpitations and high blood pressure. Its mild mood elevating qualities can be very helpful in promoting relaxation and reducing tension. The natural anti-depressant feature of lemon balrn makes it a very effective herbal remedy for anxiety. However, it is more beneficial when used in combination with certain medications or other herbs. Taking this herb in adequate dosage can be very helpful in controlling overactive thyroid, racing heart, palpitations and panic disorder. Overall, this tonic and relaxing herb controls and reduces nervousness, restlessness and anxiety to a great extent. Kava kava is another popular home remedy for anxiety. It promotes restful sleep, treats insomnia, relieves pain and relaxes muscles. Probably, the best thing about this herb is that unlike most sedative drugs, it does not cause any grogginess. Instead, it improves the performance of your mind and body and reduces stress caused by career, interpersonal and emotional factors. Overall, kava kava can alleviate the symptoms of tension, fear and anxiety quite effectively. Chamomile is also used very popularly as a herbal remedy for anxiety. Its natural ingredients have been found to be very useful in promoting restful sleep. It also relieves back pain, cramping and indigestion caused by anxiety. It does not just strengthen the functions of certain healthy adrenal hormones like cortisol, but also minimizes the effects of certain chemicals in the brain that are known to induce stress. The powerful tranquilizing effects of chamomile are similar to those of popular medications like valium and halcion. California poppy is another herbal remedy for anxiety that works gently. This antispasmodic, anti-anxiety and tension-reliving herb is though sedative in nature but does not carry any addictive features. It is considered very safe and highly beneficial especially for the elderly and children. It relieves muscular spasm, headache and sleeplessness causes by stress. Though hops are not considered an appropriate remedy to treat acute depression, it can be very helpful in treating minor symptoms of anxiety, such as indigestion and sleep loss caused by tension and restlessness. Overall, there are plenty of herbal remedies for anxiety. You are advised to consult an experienced herbal medicine practitioner to determine which of these remedies can be the most suitable for you. They will also guide you about the dosage.